Nakshatra is a 13° 20' segment of the circle described by our earth as it hurtles in space around Sun. The path is actually an ellipse but to simplify calculations it is taken to be a circle. A circle has 360° and these are divided into twelve signs of 30° each. Each segment is given a name. Starting from the first one which is called Aries, we call succeeding signs Taurus, Gemini, Cancer, Leo, Virgo, Libra, Scorpio, Sagittarius, Capricorn, Aquarius and Pisces. Thirty degrees is rather a large part of the Zodiac, so to bring more precision to our predictions we subdivide each sign into nine equal segments of 3° 20'. Four of these segments when grouped together are termed a Nakshatra and have a profound effect on our life. We said above that a Nakshatra has four segments of 3° 20' each. Each of these segments is called a Pada or charan in Sanskrit (quarter). This gives us a measure of a Nakshatra as 3° 20'X4 = 13° 20'. It follows that a sign can have only two complete Nakshatra and these two will occupy 13° 20'X2 = 26° 40' of a total of 30° that a sign has, leaving a remainder of 3° 20 minutes. If we divide 360° into sections of 13° 20' we get a total of 27 segments. Each of this segment is given a name. The first one is called Ashwini followed by Bharani, Krittika, Rohini, Mrigshira, Ardra, Punarvasu, Pushya, Ashlesha, Magha, Poorv Phalguni, Uttar Phalguni, Hasta, Chitra, Swati, Vishakha, Anuradha, Jyeshtha, Mool, Poorv Ashadh, Uttar Ashadh, Shravan, Dhanishtha, Shatabhisha, Poorv Bhadrapad, Uttar Bhadrapad and Revati. Let us take the first sign Aries and see how this arrangement looks when applied there there. 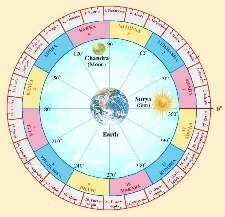 The first Nakshatra Ashwini takes up the first 13° 20'; followed by Bharani which runs from 13° 20' to 26° 40'. The remainder 3° 20° are occupied by the first quarter of Krittika and its next three Pada spill over into Taurus. This arrangement is repeated across all signs until all 27 Nakshatra are assimilated in 12 signs. Nakshatra rules the nature of native born under it greatly. Nakshatra influences as well as determines the life, nature and temperament of its natives. In Vedic myth the Moon, or CHANDRA, is depicted as Male. He is married to the 27 lunar mansions or NAKSHATRAS as they are called in Sanskrit that makes up the sidereal cycle of the Moon.This is how long it takes the Moon to move through all the signs, some 27 odd days. Each night he stays in one of the mansions until he has visited all 27 wives and the sidereal cycle is completed. But having 27 wives, Chandra does not treat them all equally. He is especially fond of the lunar mansion ROHINI, in Taurus where the Moon is exalted.